I really like breakfast teas. They have a tendency to be stronger than your average tea and will really wake you up. I’ve never been much of a morning person so I can appreciate a good breakfast tea. 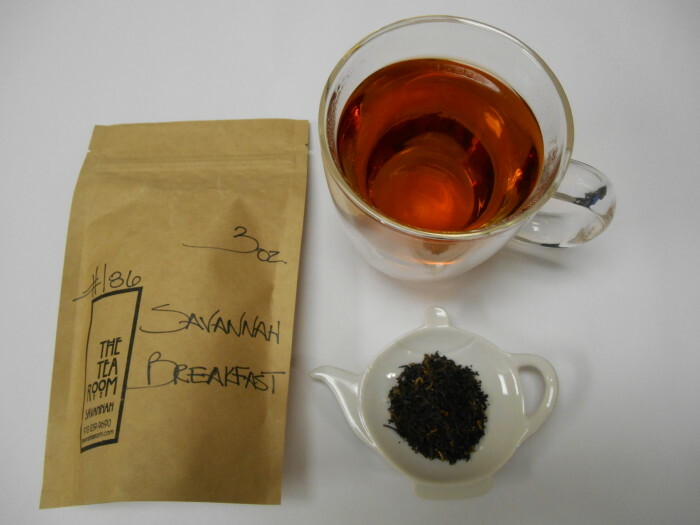 This is a special blend of Chinese, Indian and Ceylon teas from the Tea Room in Savannah GA. It’s similar in strength to an English Breakfast tea. As you can see the color of the tea, also called the liquor, is an attractive dark copper brown. It’s smell and taste are straight up strong, smooth, plain good ol’ tea. Sugar and maybe even some milk might be a good if you need to tone it down a little. A breakfast tea is a must have in your suite of teas. I do recommend this as one of the good ones. We’ve had good luck with the Savannah Tea Room teas, in general. Their tea seems to be a little higher quality than what we’ve found at some other places.